Amit Sheth, LexisNexis Ohio Eminent Scholar and executive director of Wright State’s Ohio Center of Excellence in Knowledge-Enabled Computing. 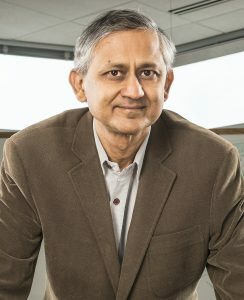 The Ohio Faculty Council has honored Amit Sheth, LexisNexis Ohio Eminent Scholar and executive director of Wright State’s Ohio Center of Excellence in Knowledge-Enabled Computing, for his success in commercializing technology. Sheth was named runner-up in the council’s annual Technology Commercialization Award program. The honor recognizes faculty members in the state university system in Ohio for exceptional research discoveries and the role they have played in supporting the translation of those discoveries into marketable products and services. Twitris technology developed under the leadership and guidance of Sheth is a cloud-hosted highly scalable software system that employs a sophisticated algorithm that analyzes social big data such as those on Twitter on a massive scale to provide unprecedented insights, suggestions, actions or predicted outcomes. For example, Sheth and his collaborators used Twitris to predict that Great Britain would vote in favor of the Brexit referendum to leave the European Union before voting was over and that Donald Trump would win the U.S. presidential election hours before polls closed. Twitris has applications in finance, branding, law enforcement, emergency management and other areas. Sheth commercialized Twitris in partnership with Wright State’s tech-transfer office, which has exclusively licensed it to Cognovi Labs Inc. Sheth is a founder of the company and is a member of its board but is not operationally involved. The company has hired Wright State University students advised by Sheth as employees. Jason Heikenfeld, professor of electrical engineering and computer systems at the University of Cincinnati, was the council’s top award recipient for his non-invasive sweat biosensing technology that has applications in medicine, industry and sports. He has leveraged the technology and 26 associated patents into the creation of a startup company, Eccrine Systems, which has grown to several dozen employees and been recognized by Bloomberg as one of the 50 best startups in the country. “The public university system of Ohio is a key incubator for innovation, and the OFC embraces the opportunity to celebrate the role that our phenomenal faculty play in economic development,” said Dan Krane, chair of the Ohio Faculty Council and professor of biological sciences at Wright State. The council represents the faculty at all of the four-year public universities in Ohio. It addresses concerns common to faculty and presents a faculty perspective on major issues affecting higher education. It is committed to supporting and bringing attention to the critical role that Ohio’s institutions of higher education play in revitalizing the economy of the state and the nation by attracting and training an educated workforce. Learn more at ohiofacultycouncil.org.